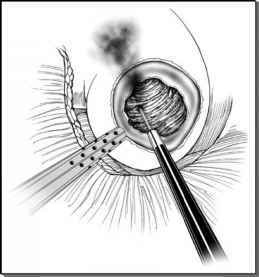 FIGURE 4 ■ Trocar placement for left-sided laparoscopic live donor nephrectomy. A 6-cm Pfannenstiel incision is used for allograft extraction. FIGURE 5 ■ The line of Toldt (arrow) is incised to begin mobilization of the descending colon (C). It is crucial to release only the peritoneal attachments between the colon and the lateral sidewall; deeper dissection can result in the kidney dropping medially and obscuring the renal hilum, precluding safe hilar dissection. This also prevents inadvertent torsion of the kidney on its vascular pedicle during manipulation. Dissection too close to the mesentery may result in injury to mesenteric vessels and bleeding, which may obscure the plane of dissection or cause a mesenteric defect. In addition, premature violation of Gerota's fascia may also cause excessive bleeding and limit identification of the renal hilum. The tip of the dissection instruments should be maintained in direct view because past-pointing may lead to diaphragmatic injury and pneumothorax. Visualization of the fundus of the stomach is the landmark used to signal that complete mobilization has been achieved. direction over the anterior surface of the kidney toward the spleen (Fig. 5). There are often adhesions from the descending colon at the level of the splenic flexure to the anterior abdominal wall; these attachments need to be divided to carry the incision of the line of Toldt along the spleen toward the diaphragm. This includes releasing any splenophrenic attachment, thereby mobilizing the spleen from the abdominal sidewall. Once the peritoneal attachments have been divided, the avascular plane between Gerota's fascia and the mesentery of the colon is identified and developed. The bright yellow fat of the colonic mesentery is separated from the glistening white fibers of Gerota's fascia. The mesentery is bluntly dissected and mobilized medially. Tethering attachments are divided with the harmonic scalpel. Identification of this plane is critical. Dissection is taken in a cephalad direction and continued by dividing the splenocolic ligament, which allows further medial mobilization of the descending colon. The surgeon's left-handed instrument (Maryland dissector) gently retracts the spleen medially, allowing incision of the splenorenal ligament, which further releases the spleen and precludes inadvertent tearing of the splenic capsule. Bleeding from the splenic capsule should be managed with gentle pressure and application of a hemo-static agent, such as Surgicel®. In addition, the argon beam coagulation device is often successful in achieving hemostasis in minor splenic tears. Major splenic injuries often require open conversion for splenorrhaphy. The dissection then follows the plane between the spleen and pancreas, and the upper border of Gerota's fascia. Attachments are divided using the harmonic scalpel, and the surgeon will feel the spleen releasing medially (Fig. 6). The tip of the dissection instruments should be maintained in direct view because past-pointing may lead to diaphragmatic injury and pneumothorax (20). The operating table can be rotated medially to facilitate the dissection. The goal is to release all the lateral attachments of the spleen so that it does not have to be retracted during the procedure, thereby minimizing the chance of injury. In addition, this will allow safe dissection of the upper pole of the kidney with minimal risk of splenic injury. Additional attachments between the pancreas and Gerota's fascia will also be seen and can be bluntly dissected. Minimal traction should be placed on the pancreas during its mobilization.